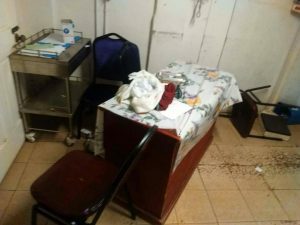 The condition of a doctor’s office at West Demerara Regional Hospital in the aftermath of an assault of doctors by a patient and relatives. A drunken man and his relatives assaulted a doctor and damaged furniture and other items at the West Demerara Regional Hospital Sunday night after they were told that the X-Ray machine there was not working. “An intoxicated patient came to see the doctor with relatives and he was informed that the X-Ray was not working and he got up and started to bang the table,” sources said. Six alleged perpetrators have since been arrested. The shaken doctors were up to late Sunday night at the Vreed-en-Hoop Police Station. Sources said a baby was rescued during the melee after the father intervened in the initial minutes of the altercation. The security guard at the hospital was described as an “old man” who is “totally useless”. Sources said disorderly behaviour at the hospital has become a norm at the West Demerara Regional Hospital and nothing has been done to improve security there despite repeated requests. When the incident erupted, the female doctor dashed for safety. A male doctor was then assaulted, sources told Demerara Waves Online News. A male patient, who was there with his baby, was assaulted by the drunken man’s relatives when he intervened. A female doctor was forced to rescue the baby. Furniture and medical supplies were tumbled and tossed around in the process.